Pippa Middleton "wrote" an "article" for Vanity Fair. She used (typed?) words. 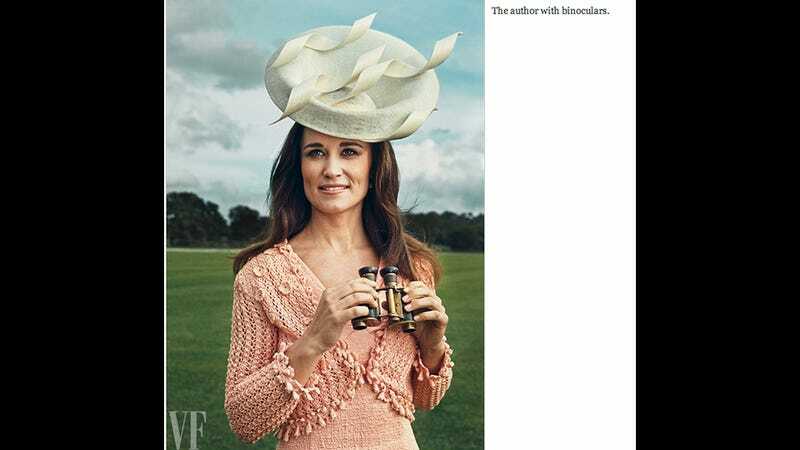 The piece, which serves as a guide to Royal Ascot Week, the premier Thoroughbred racing event in Great Britain, is accompanied by a photograph of Ms. Middleton holding binoculars and the caption "The author with binoculars." There are words in the story. Some of these words are rather curious. Do people really talk/write like this? Was this edited? Does Pippa actually say "film stars"? Is she the Dowager Countess? Does she pronounce it "fillum"? They're called movie stars. Try it: Moooo-vie. What's that? No, you don't sound like a cow. You sound like a normal human. I can, with grave certainty, say that I have never ever seen the word "characterful" before, and obviously "characterful hat" is a completely new and unexpected turn of phrase for me. Still digesting. Oh. The opulent, incredibly exclusive, aristocrat-laden event at which 11 monarchs have been in attendance and Her Majesty is present — and has been since 1945 — to which "gentlemen" must wear top hats — is a jamboree? Righto. I haven't experimented with a wacky statement headpiece just yet, but I'm working on it!